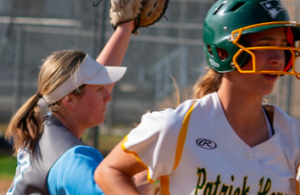 RANCHO SAN DIEGO (4-14-2019) – The North County bias entrenched throughout the high school softball rankings published by the San Diego Union-Tribune continues, as preseason No. 1 Mater Dei Catholic has dropped three spots despite not losing to any CIF San Diego Section opponents. 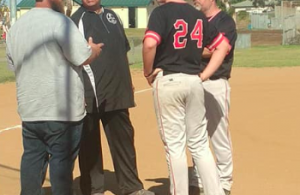 The Crusaders, along with Granite Hills, Poway and others, were invited to step up and participate at the Michele Carew Classic in Orange County, battling many of the state’s top programs. Yet the U-T vote seems to penalize all three of these top-notch, local ballclubs for losing. In the minds of the softball community (except the newspaper), if Mater Dei Catholic is the true No.1 ballclub, Steele Canyon should be proud by hanging with the Crusaders in Falcon Fiesta pool-play action on Saturday (Apr. 13). Sure, the Crusaders won 5-0, to extend their season-long “domestic” winning streak to 13 games, but the contest wasn’t decided until the late innings. The effort was a carry-over from Game 1, as the Cougars out-slugged Mira Mesa, 10-6, giving Steele Canyon a satisfying split heading into the final month of the regular season. STEELE CANYON 10, MIRA MESA 6: Cougars senior shortstop J.J. Venzor registered a career-high five RBI and extended her hitting streak to 10 games to dispose of the Marauders in the morning Falcon Fiesta contest. Leading 4-3 through three innings, the Cougars erupted for six runs in the final two frames. Venzor (4-for-4) and Audrey Bagge (3-for-5) each belted homers and doubles to fuel a 14-hit attack. The tight game was broken by the long ball. In the 6th, following a two-out walk to Kassandra Jaggard, Venzor went deep to left field to push the lead to 6-3. It was her fourth homer of the season. An inning later, Bagge placed the finishing touches on the victory, slugging a 3-run homer with two out in the 7th. It was her seventh homer of the year, moving her back to within one of the East County lead. For Steele Canyon (10-10), Bianca Morales and Amanda Whipple also contributed run-scoring singles. Mira Mesa (6-11) sophomore Amae Moots, the designated player, posted three RBI including a run-scoring double, batting 2-for-4. Left fielder Angelique Schermerhorn went 2-for-3 with a walk, scoring twice. MATER DEI CATHOLIC 5, STEELE CANYON 0: The Lady Dons completed a perfect 4-0 slate in Pool D, but not without a push from the Cougars (10-11). 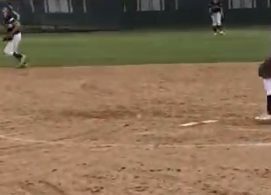 UCLA bound pitcher Lexi Sosa, one of the leading candidates for CIFSDS player of the year, fired a 2-hit shutout. But the Dons couldn’t expand a 1-0 lead until the late innings behind a strong pitching effort by the Cougars’ Grace Richter. Steele Canyon’s best chance to score came in the 5th, when Danielle Directo accepted a leadoff walk, then was bunted to second on a sacrifice by Mariah Mata. However, Sosa responded by striking out both J.J. Venzor and Audrey Bagge — not embarrassing considering Sosa is considering one of the nation’s best. In the 7th, Bianca Morales and Amanda Whipple both tagged Sosa with consecutive lead singles to end the no-hit bid. But Sosa completed the shutout with a fly out and a game-ending double-play grounder. For the Crusaders, an RBI single by Alyssa Garcia in the 2nd proved to be the game-winning hit. The designated player and leadoff batter, who also signed to attend UCLA after being invited to the USA Junior National Team selection camp, went 2-for-2 with a walk, scoring once. In the 5th, Alexia Morales lifted a sacrificed fly, followed by a run-scoring double by Jalyse Hanson. Finally, in the 6th, catcher Sami Gutierrez slammed a home run to center field.